Celebrate the highly popular Japanese anime television show Dragon Ball Z with these stylized Pop! 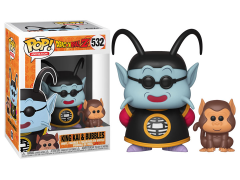 Figures including duos Yamcha and Puar and King Kai and Bubbles. Each vinyl figure stands 3.75 inches tall and comes in window box packaging, making them great for display!